Well said above... The "nut-behind-the-wheel" is always the biggest influencing factor. I always wanted to fix the core support on that thing, but John wouldn't let me. -Last dyno the engine made a whopping 304rwhp. A bit too much cam on the last rebuild unfortunately. Mufflers are flowmasters with a nascar-style tip welded to the sides of the cans for side exit and the factory hole on the muffler capped. The boom Tubes were being crushed between the SFC and "debris" (cones) from time to time. Thank you very much. It was such a cool moment when the T/A went by on the PT. It looked and sounded killer as it went by. I drove our "then new" 2015 Challenger at Willow Springs in April 2015. In turn 2, a long U shaped turn, I felt maxed out at 66-67 mph. I let an instructor drive the car with me in the passenger seat. He was doing 80 and the car seemed just as stable. For me, it felt as if I were at the limits of grip. I think he was able to have the increased speed since he entered the turn better with a better line and more speed. A few years back at the MATS, I got to ride along with Mary Pozzi in the emax Challenger. It was quite a blast, and that lady can drive. I couldn't believe how that car sticks to the road. She freaked me out from the start as she blasted towards the first corner, and never let off the gas! In my mind I was thinking "isn't she going to slow down for this turn", well she didn't have to. Later in the day I got another ride with her in one of the "new" Camaro's. It was nearly as fast, but just didn't have the feel and sound of raw power that the Challenger did. Last edited by MileHighDart; 02/11/18 05:10 PM. Not being your car helps too! I've riden in it twice, soo much fun! That car was dialed in and a fun little street car. 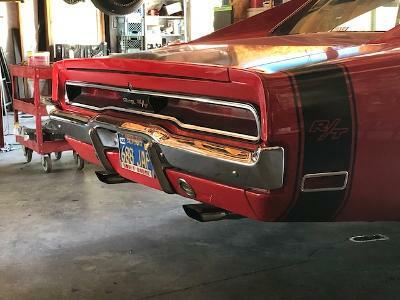 My Charger suspension was rebuilt using some of their parts and hoping to make it live this summer.